Tired of your nail polish chipping after you've a) spent a lot on your manicure and b) it's only been two days? Trust me, I've been there. You get all excited about your new pretty nails, and then presto! Before you know it, it looks like you've been scaling rock walls and ripping open packages and envelopes in a mailroom for days. 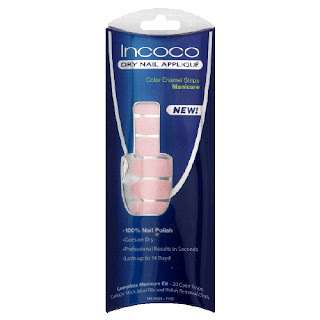 But never fear -- Incoco Dry Nail Appliques are here! Different than your regular nail polish, each Incoco kit comes with 20 dry nail appliques that you press onto your fingernails for instant, long-lasting color. It sounds like the dreaded Lee Press-On Nails from the 80s, but trust this beauty chick when she tells you they're nothing like that. Included with the appliques are a polish remover cloth (which seriously took off my old polish in about two seconds, making a mental note to stock up on more of those! ), a cuticle stick, and a mini nail file. Simply tear off the protective casing on each strip, select the appropriate size for your nail, line it up with your cuticle bed and press down. And voila! Instantly your nails look like you just had them manicured. It really is that simple! The only downside is ripping off the extra (since each size is much longer than anyone's natural nails should ever, ever be) -- but that's what the handy-dandy little nail file is for. My favorite shade is Tinkerbelle -- a subtly pale pink flecked with glimmering glitter. But there are 20 solid colors and 6 French Manicure colors to choose from!